Welcome to Frayley's Kennel. 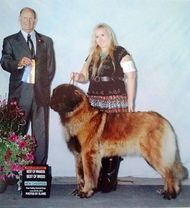 We are Michelle Davis and Jerry Smith and we have been Leo lovers since 2004 when we met our first Leonberger puppy .We met a local breeder at the veterinarian's office where she had brought in her Leo pups. Jerry fell in love with them and came home and told our family all about the cutest puppies ever. We immediately set out to learn more reading everything we could find about the Leonberger. A few days later we met the breeder and visited her litter of 6-week-old puppies. The following week we again visited the puppies we were so excited to bring home our puppy. Finally a week before Christmas we brought home our puppy Amara. She was such a gift. Just a few weeks later we decided that Amara needed a friend. We set out in search of a male puppy about her age so they could grow up together and be best buddies After several weeks of searching and networking with breeders in many states we heard about a puppy in Canada. 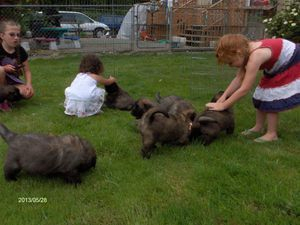 We contacted the breeder and found out that the original family for that puppy was not going to be able to take him The following weekend we drove up to Canada to meet Dakota; Amara and Dakota were fast friends They have been inseparable since. A year went by in a blink and our two little puppies grew into big playful energetic puppies We had so much fun watching Amara and Dakota grow and learn we decided to get another puppy the following year. I contacted the same breeder we got Amara from and found out she had a 4 week old litter. We visited her several times and brought home Holly the day after Christmas .We live in Arlington, Washington on 10 acres We have plenty of room for our Leos to run about We have streams ponds and fields to explore Please visit www.offa.org for more background on our past girls Frayley's Delitful Sierra CHIC 77994 Pride of Aslan Grand Amara LCA#DZG3416 and Pride of Aslan Holly LCA#DZH3715 and our big guy Dakotadawn de Lamaitre LCA#EGD3405. Our current ladies are Lowenhole's Whimsical Kai Lie CHIC# 91978, Frayleys Harmoney in the Cedar Grove..Cedar CHIC# 108389, Lehla currently 3 years, and our "baby", Aria at 7 months. Please visit our contact page for more information on these great dogs.